Discussion in 'Injection Tech' started by Bill USN-1, Jan 25, 2006. Now how about something easy for the ignition. Here is the DS distributor running a GM 4 wire ignition module. Now you get modern electronics (same as the $$$ HEI Distr has) that are available in every parts store. As a preview, Here is a little teaser video showing my conversion avail direct, using the optional round HEI coil. I also recommend the voltage to the coil be directly from a power relay so it receives full battery voltage and just use the original key switch wire to energize the relay. NOTE: ignition module MUST be mounted on a heat sink like 1/8" alum, and it MUST be mounted with thermal conductive paste(CPU mounting paste). Do not use the parts store dielectric grease. The heat sink should also be bolted directly to the engine to provide a good ground for the module. The module grounds through the mounting screws so both must be installed. Here it is installed by John H.
No longer the best option...see 4 pin GM above for an easier ignition option. 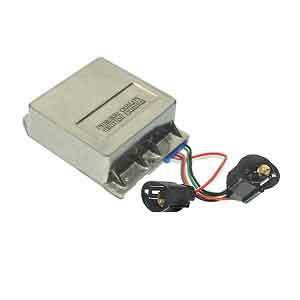 Plug the Ford Duraspark ignition module into the distr harness and wire in the 12V. This was my first major change to my scout when the GB died. You can grab the wires and the ignition box from the junk yard when you get the base plate. I normally pay $10-$15 for everything. If you look around, sometimes you find some near new replacements parts hiding in there! The later TFI coil is another option while you are grabbing parts. It's an epoxy core coil so there is no oil. Like the GM coil. Used by Jeep guys with DS. EDIT: white wire should go to S terminal vice I terminal. If you want MSD with the DS pick up!!! 1.Remove the distributor cap and rotor. 2. Disconnect the pick-up coil lead. 3. Set the ohmmeter on the high scale and connect it as illustrated in test No. 1. 4. The ohmmeter should read infinity at all times. 5. Next, set the ohmmeter on the low scale and connect it as illustrated in test No. 2. 6. The ohmmeter should read a steady value between 500-1500 ohms. 7. If the readings are not as specified, replace the pick-up coil. 8. If no defects have been found at this time, and you still have a problem, then the module will have to be checked. If you do not have access to a module tester, the only possible alternative is a substitution test. 1. Disconnect the coil wires and set the ohmmeter on the high scale. 2. Connect the ohmmeter as illustrated in test No. 1. 3. The ohmmeter should read near infinite or very high. 4. Next, set the ohmmeter to the low scale. 5. Connect the ohmmeter as illustrated in test No. 2. 6. The ohmmeter should read zero or very low. 7. Next, set the ohmmeter on the high scale again. 8. Connect the ohmmeter as illustrated in test No. 3. 9. The ohmmeter should NOT read infinite. 10. If the reading are not as specified, replace the coil. 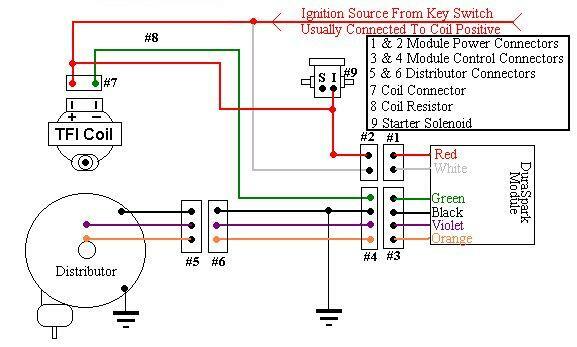 For Fuel Injection here is the wiring diagram to connect your DS conversion to the 8 pin EST. Thanks to Brendan for the diagram. A. Set engine to TDC compression stroke. For IH use #8 for V8s and #1 for 4 cyls. For all other makes use the correct plug. B. Remove the cap and verify the rotor phasing is correct IAW the distr conversion thread. Rotor should be just past center of the cap terminal in the direction of rotation(clockwise for IH) and the reluctor should be lined up. C. Connect timing light and disconnect the timing bypass connector if EFI. D. Crank engine to check timing. If the wires are connected properly then the timing will be within 5* of 0*. Just set timing to 0 and your good. If the timing is 20-30* away then swap the P and N wires and check again. To test the stator (also known as the magnetic pickup assembly), you will need an ohmmeter. Run the engine until it reaches operating temperature, then turn the ignition switch to the off position. Disconnect the wire harness from the distributor. Connect the ohmmeter between the orange and purple wires. Resistance should be 400-800-. Next, connect the ohmmeter between the black wire and a good ground on the engine. Operate the vacuum advance either by hand or with an external vacuum source. Resistance should be 0-. Finally, connect the ohmmeter between the orange wire and ground, and then purple wire and ground. Resistance should be over 70,000- in both cases. If any of your ohmmeter readings differ from the above specifications, then the stator is defective and must be replaced as a unit. The ignition coil must be diagnosed separately from the rest of the ignition system. 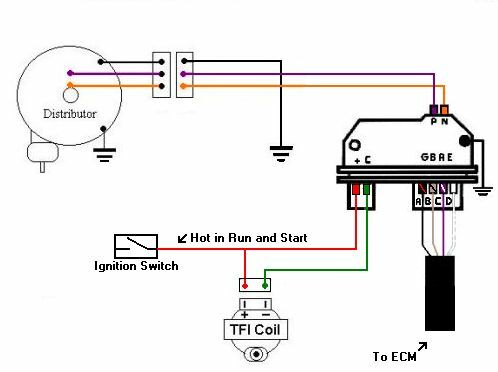 Primary resistance is measured between the two primary (low voltage) coil terminals, with the coil connector disconnected and the ignition switch off. Primary resistance should be 0.3-1.0-. On Dura Spark ignitions, the secondary resistance is measured between the BATT and high voltage (secondary) terminals of the ignition coil with the ignition off, and the wiring from the coil disconnected. Secondary resistance must be 8,000-11,500-. If resistance tests are okay, but the coil is still suspected, test the coil on a coil tester by following the test equipment manufacturer's instructions for a standard coil. If the reading differs from the original test, check for a defective harness. Here is the DS distributor running a GM 4 wire ignition module. So if I'm going with GM EFI, this is the way to go right? Will it plug right into an existing connector on the GM EFI harness?? Nope, these are for the DS conversion that is not for the EFI. When you do the conversion for the FI you just hook the purple wire to the P and the orn wire to the N terminal of the 8 pin ESTign module that you mount on a plate next to the coil. The black wire goes to gnd. I'll Add the EFI diagram and connections. Check back in a few!!! Bill, are the Duraspark distributors common across the entire Ford V8 line? Will one from a 302 have the correct baseplate? As long as it is a duraspark and not a TFI, you are fine. The TFI will have the ignition module mounted on the side of the distr. I have used 302, 351, and 460 DS distr parts!! What is the correct value for the ballast resistor? 3.2 ohm (acording to the counter clown) or the more common 1.2 ohm? You only need the ballast resistor if you are still using a coil that ran a ballast resistor. I ran the later epoxy coils and no ballast resistor. If you converted from a points system and kept the original coil then you will need to keep the ballast resistor. There may be more than one resistance value based on the application. sorry, running the DS system. Wired as pictured in the first wiring diagram in this thread. Using the parts called out here also. Here is some good troubleshooting and diagrams. It appears the 76 system used a ballast resistor and the 78 and up did not. It also appears there is a wiring error on the second diagram with red and white going to the Run circuit. It will probably work but may not be the best way to wire it. All the diagrams I have seen only show the resistor going to the coil so it doesn't affect the voltage to the module it's self. So I do not see the ballast resistor being a factor. Are you running the module with the blue strain relief? The number one killer of modules I have seen is the grounds (or lack of). And the most important is the module to whatever it is mounted on. Have you already performed the test in the link? Yes, the module has the blue strain relief. good grounds with NEW braided straps everywhere. We're weekend warriors here, Haven't done anything yet. Looking for info B-4 going into battle. NAPA ingition modules are garbage! Napa module #2 was defective right out of the box. Module #3 ($5 at pick-a-part) works perfectly! Well I sure hope it last longer than the first 2!!!! 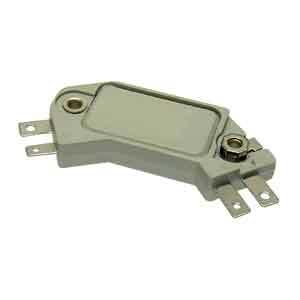 If you keep having problems maybe the next trip to the JY pick up a GM 4 wire module!! It's the only part that is different! The HEI-4 modules are only ~$13 at Autozone with a Lifetime warranty. I'd just get one there, and if you fry it, go get another one. Make sure you get it mounted to something that will act as a heatsink, though. I used a piece of flat bar. So all I need to change is the module? I can use the same coil and dist innards? That would be a no brainer! The DS module is $30 for the econo and $96 for the premium at Napa. The $5 JY special is still working, but I don't have a lot of faith in it. Terry, I still have a blue grommet DS box in the garage you can have for the cost of shipping. It was a spare I had way back when I was running Fords, and I'll never use it. PM me if you're interested and we'll work out the details. I'm running a 4-pin HEI module with a DuraSpark distributer and TFI coil on my AMC I6. The only complaint I have about the HEI module is that it does not retard the spark during cranking like the DS module does (that's what its white wire going to the starter solenoid tells it to do). The problem I have now is that somtimes when cranking one cylinder will fire before the others catch, which due to the advanced timing will fight against the starter by kicking back, sometimes stalling the starter motor for a second before it continues cranking. About a month after switching from the DS module to the HEI, my battery died in mid-crank at a gas station. One of the kick backs shorted it internally. I replaced the battery and later that week the starter died when I was trying to leave work . Push started it in the parking lot, replaced the starter, and decided to retard the timing until it started smoothly. Only problem now is that the timing is too low for the engine to operate efficiently... poor gas mileage, big loss of power across all RPMs. After about 3 weeks I couldn't take driving a gas-guzzling slug anymore and advanced the timing again... a week later my replacement starter died! So I replaced that one under warrantee, reduced the timing but not as much as before, and I think I found a tolerable compromise... the starter will let me know for sure in the near future. Anyone else have problems like this?? I can't wait to go EFI and not have to deal with this anymore! 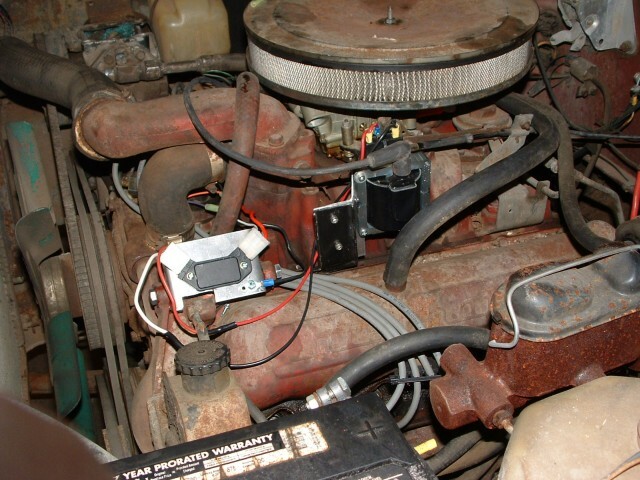 My '87 AMC 258 I6 with factory DuraSpark ignition uses a resistance wire to feed the coil. I removed it when I switched to the HEI module. I read on the Jeep boards that even though the resistor only goes to the coil, it does in fact affect the module. Something about when the coil gets a full 12V it puts out more voltage to the plugs, but this puts alot more strain on the DS module, which could cause it to burn up. I read about alot of people who pulled the resistors out of their CJs only to go through DS modules pretty quick. I was trying to find the threads I read this in, but jeepforum's search feature is currently down while they upgrade their servers. Sounds like you were trying to run a lot of timing on your motor. I would not think that would happen if you were running stock specs. The position of the rotor in the cap should determine which plug is getting fire. You would have to be a long way away to hit the cyl before! AFAIK none of the stock IH ign systems retard timing during starting. So any add on ign should function the same. But I would like to find more info on the ballast resistor. I have seen a couple diagrams for the TFI and some guys run a resistor with the coil and others don't. Most say they have no problems either...but there is always someone who had a problem.